Discover the best of the Spanish history, in this 7 day SMALL GROUP (max 20 passengers) tour. From the magic of the city center of Seville, to the narrow alleys of Toledo, passing through the multicultural heritage of Cordoba, with its Mosque-Cathedral, and the Jewish quarters, and the impressive fortress of La Alhambra in Granada, starting with an unique gastronomic and dancing experience in the best flamenco venue in the world. Arrival in Madrid international airport, and transfer to your hotel. Accommodation. In the morning, enjoy a complete sightseeing tour of the city, by bus, through the most important avenues, squares and buildings of Madrid with an official guide who will explain the monuments and their history through the different times, from the old neighborhood of the Bourbons, where we will know the Puerta de Alcala and the town hall, Cibeles Square, Gran Vía, Paseo de la Castellana, Paseo del Prado ..., continuing towards the Madrid of the skyscrapers and the financial area of the city. Rest of the morning at leisure. After the show, be transferred back to your hotel. Departure through La Mancha country to Cordoba. Sightseeing tour, visiting its famous Mosque/ Cathedral and Jewish Quarter. Entrance fee to the mosque included. After the tour, continuation to Seville. Dinner in hotel. Half board in the hotel. 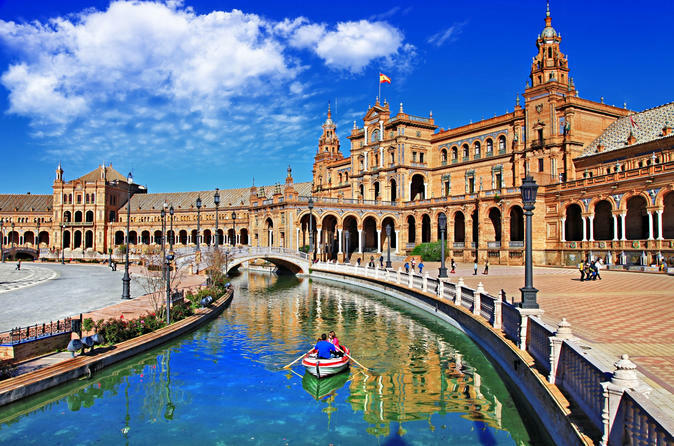 Morning city tour, accompanied by an expert local guide, stroll the ambient tangle of streets to UNESCO World Heritage-listed wonders and impressive historical monuments; see the Renaissance beauty of Plaza de España; Seville Cathedral; the maze of Santa Cruz, and see the outside of Royal Alcazar Palace. Breakfast. Departure to Granada. Sightseeing tour visiting the impressive Alhambra with its beautiful Nazari Palaces and the Generalife. Dinner. Breakfast and departure towards the Imperial City of Toledo, full of history and monuments. Lunch and city sightseeing throughout its narrow streets and alleys. Enjoy this panoramic walking tour of Toledo, accompanied by a local expert guide, into the old quarters to visit the Town Hall Square and the outside of the impressive Primate Cathedral. We will continue through the old Jewish quarter to enter the Church of St. Tomé, with the very famous painting of El Greco “El entierro del Conde Orgaz”. Then we visit the old Synagogue of St. Maria la Blanca, symbol of the coexistence of the “Three Cultures”. We will also visit a typical factory of Damasquino, well known handicraft art of Toledo. Breakfast. Check out and transfer to the airport to take the flight back home.